Probably one of his last major paintings, this allegorical triptych takes an unusual theme, which it presents in rich and rollicking detail. It is perhaps his last great masterpiece to have survived. Almost as celebrated in the 1500s as his Garden of Earthly Delights, this triptych also appears to have been intended for an aristocrat rather than a place of worship. There was at least one copy in Spain, which is probably that now in the Escorial, and there may have been other copies in Europe. It was made into a tapestry after 1539. 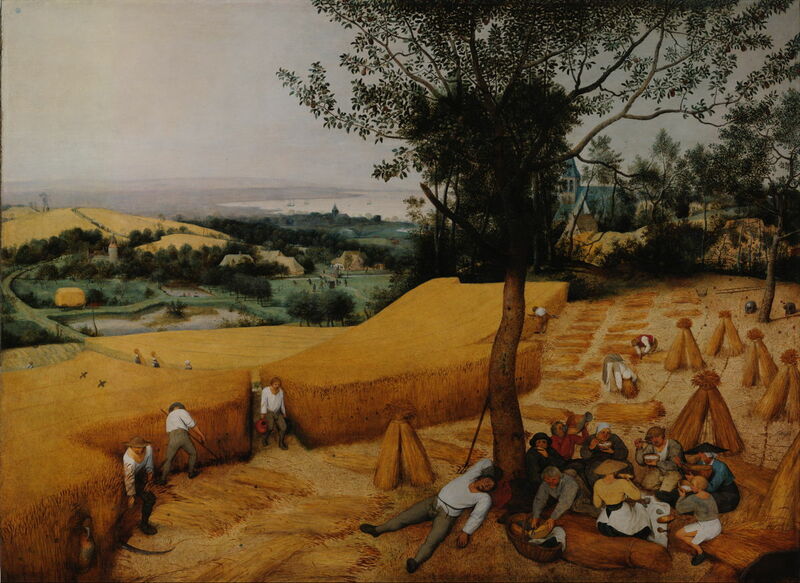 Its moralising theme, which appears similar to that of the Wayfarer Triptych, is here expressed in terms taken from a poem from about 1460-70 which uses the allegory of a haystack. Ilsink et al. also point out Saint Bernard’s well-known sermon referring to pilgrim travellers on the king’s highway, as an important influence. Bosch transforms those into the journey through life in the countryside of the time, with glimpses into sometimes humorous aspects of rural life – and its many sins. In this, it was a precursor to many rustic paintings of Pieter Bruegel the Elder (c 1525-1569). Pieter Bruegel the Elder (c 1525-1569), The Harvesters (1565), oil on panel, 119 x 162 cm, Metropolitan Museum of Art, New York, NY. Wikimedia Commons. The exterior, showing a traveller making his way through the dangers of the countryside, opens to reveal the brilliant colours and details of the Fall of Man, a rustic scene centred on a large wagon of hay, and the torments of Hell. 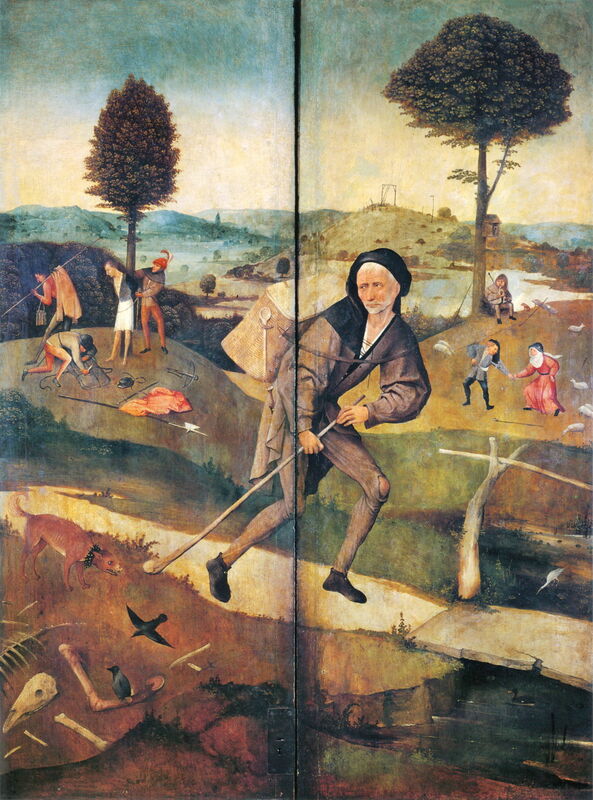 Hieronymus Bosch (c 1450–1516), The Haywain Triptych (exterior) (c 1510-16), oil on oak panel, left wing 136.1 x 47.7 cm, central panel 133 × 100 cm, right wing 136.1 × 47.6 cm, Museo Nacional del Prado, Madrid. Wikimedia Commons. The exterior shows an older man walking from left to right along a narrow path, which passes through meadows. Unusually for Bosch it is not painted in grisaille, but in full colour. The man has white hair and a close-cropped full beard, and looks to the left of the panels. He wears a black chaperon-style hat, a long brown tunic, and matching brown trousers. His tunic is loosened at the neck and upper chest to reveal a black waistcoat and white underclothing. The left knee of his trousers is split to reveal most of that kneecap. He wears a pair of short black boots. A sheathed knife is on his belt, and he holds a walking stick, with its club-like end on the ground, in front of a collared dog which is snarling at him. On his back is a large wickerwork pack, a large wooden spoon on its side, which is fastened around his arms and chest with a leather strap. Just in front of him, the path crosses a small stream by a stone bridge with a primitive handrail. There are birds in the water: a grey heron (or possibly a little egret), and a moorhen. In the lower left corner are long bones and a skull from a dead animal such as a horse. Behind him, on the left, three robbers are tying another traveller to a tree, having stolen his outer clothing and his pack. They are armed with a crossbow and pikes, which rest on the ground by them. On the right, in the distance, a man and a woman are dancing amid their flock of sheep, to the music provided by a bagpiper, who is sat underneath another tree, which has a large box fixed to its trunk. The background shows rolling pasture and woods, rising to a hill on which a large gallows is being erected. A church tower rises from a town in the far distance. The internal panels show, on the left, a multiplex account of the Fall of Man set in the Garden of Eden, with God the Father shown in the narrative content and in Heaven above, and the fall of angels occurring at the same time. The central panel shows a rich cavalcade of figures, including the emperor and Pope, nobility, courtiers, and many peasants, accompanying a huge and heavily-laden wagon of hay, which is processing from left to right. They are being overseen from Heaven by Jesus Christ. Finally, the right panel shows sinners entering into Hell and undergoing many physical torments, with its fires destroying all in the distance. 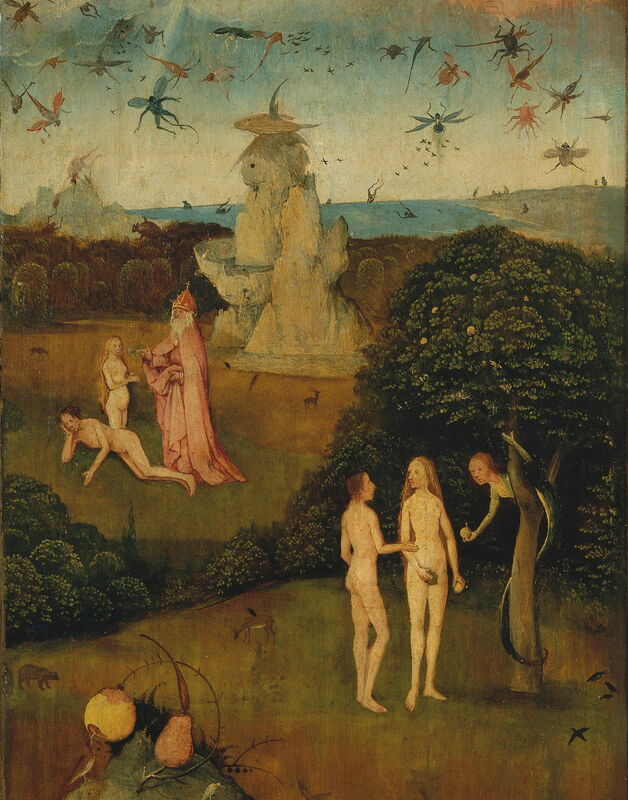 The left wing show the Garden of Eden, with three scenes depicting the Fall of Man, occurring on grassy lawns amid the trees. In this case, this multiplex (continuous) narrative is read from the back to the front. In the middle distance, God, standing in red robes, has just created Eve, who stands naked on his right. Adam, also naked, rests on the grass in front of them, facing away. Near the centre of the panel, Adam and Eve are stood at the foot of a large apple tree. Part way up its trunk is a serpent with a human head and arms, which is offering them an apple. In the foreground, Adam and Eve are covering their crotches with their hands and leaves, and stand outside a stone arch beyond the edge of the Garden. A winged angel is brandishing a sword at them, banishing them from the Garden of Eden. The lawns of the Garden have various birds and beasts on them. In the distance is a strange and large rock formation which has semi-human appearance, and contains a pond. There are further rocks and denser woodland, leading down to the coast. In the heavens above, God (the Father) sits in a bright golden area, holding a blue globe. Below him are a great number of winged angels, who are tumbling from the clouds. As they descend, some appear to have transformed into winged creatures and daemons. A few have fallen into the distant sea. Hieronymus Bosch (c 1450–1516), The Haywain Triptych (centre panel) (c 1510-16), oil on oak panel, left wing 136.1 x 47.7 cm, central panel 133 × 100 cm, right wing 136.1 × 47.6 cm, Museo Nacional del Prado, Madrid. Wikimedia Commons. The centre panel features the haywain at its centre, part of a dense procession of figures slowly making their way from left to right across the middle of the panel. In the foreground is a line of more static figures. From the left, these include a pious couple, a woman changing her baby’s napkin, behind whom a pig’s head is roasting on a spit, a quack healer who is inspecting the mouth of a patient, a person playing bagpipes, and a group of four nuns working with sacks of hay, and a seated monk. To the left of the haywain, the emperor, Pope, king and a duke ride their horses, attended by nobility and a dense crowd of courtiers. Closer to the viewer is an assorted rabble, including a cripple who seems to be dancing but is being threatened with a dagger, a woman with a young baby, into whose skirts a young man has collapsed, and more. On the nearer side of the haywain several fights have broken out over the hay, and one man is cutting the throat of another, who is pinned to the ground. Figures appear trapped within and under the wagon’s wheels. To the right of the haywain, there are more figures packed together, but those nearer the viewer (in front of a rock pinnacle, which has odd structures on top) are not human. They are portmanteau creatures, some with long snouts, a large fish, a deer with antlers, and several daemons. A group of eight are on top of the load of hay with a large bush. At the left, a winged angel is praying and looking up to heaven. A man is peering from behind the bush, a couple are embracing as if ready to kiss, a musician sits playing a lute for a woman who holds sheet music ready to sing, and a blue winged daemon blows a pipe. An owl is perched on a branch which protrudes from the bush. The distant landscape is of towns around broad rivers, with a high rock buttress over to the right. Above, in the clouds, Jesus looks down on the scene. He wears a red cape, fastened at the neck and leaving his chest bare, and holds his hands out to show his stigmata. Hieronymus Bosch (c 1450–1516), The Haywain Triptych (right wing) (c 1510-16), oil on oak panel, left wing 136.1 x 47.7 cm, central panel 133 × 100 cm, right wing 136.1 × 47.6 cm, Museo Nacional del Prado, Madrid. Wikimedia Commons. The right wing shows a succession of scenes of torments, death, fire and destruction. In the foreground, a large bloated fish with legs is swallowing a person, their legs still protruding from its mouth; a snake winds around the right leg. A daemon holds a human figure upside down; that person is being eviscerated. Another naked human is being attacked by strange hounds, near a dank tunnel. Behind them, weird portmanteau daemons are moving other naked humans around. One lies on the ground, its hands tied behind the back. Another is astride an ox, a spear passing through its chest. Behind them is a round tower, whose upper parts are still being constructed. A daemon ascends a stepladder up the outside of the tower with a board heaped with mortar. A crane and windlass on the top of the tower are manned by daemons too. Perched on the top lip of the tower is a huge bird with red wings. In the distance a flat field contains scattered bodies, behind which the ruins of buildings are silhouetted against a red smoke-filled sky by fires. Up in the sky a daemon riding a large creature (perhaps a fish) is chasing a bird. 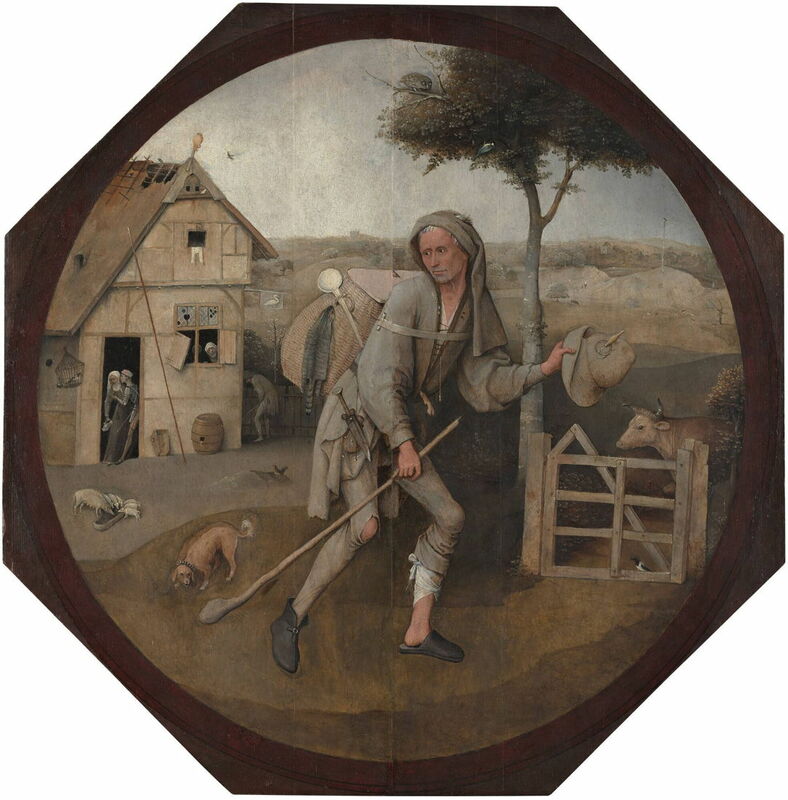 The wayfarer shown on the exterior is extremely similar to that on the exterior of Bosch’s Wayfarer Triptych. Some interesting differences are that here his legs are not bandaged, and his boots match. He is therefore perhaps in better condition to face the trials and tribulations of his journey through life. There remains dispute as to whether these two wayfarers are necessarily peddlars, carrying goods to sell in their packs, or simply travellers, carrying their immediate possessions. As Bosch gives us no clues that they are necessarily peddling, I think it is dangerous to assume that they are, and then to draw conclusions from that. 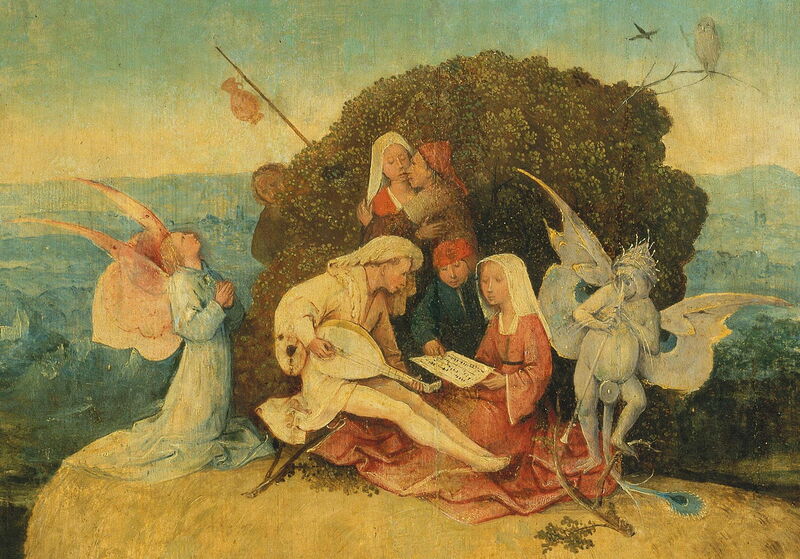 The central panel appears unique among Bosch’s (and other artists’) surviving works, but the wings are closely related to other paintings of his. The left wing is clearly similar in form and content to the left wing of the Vienna Last Judgement, although the scenes in the narrative are rearranged and details differ. 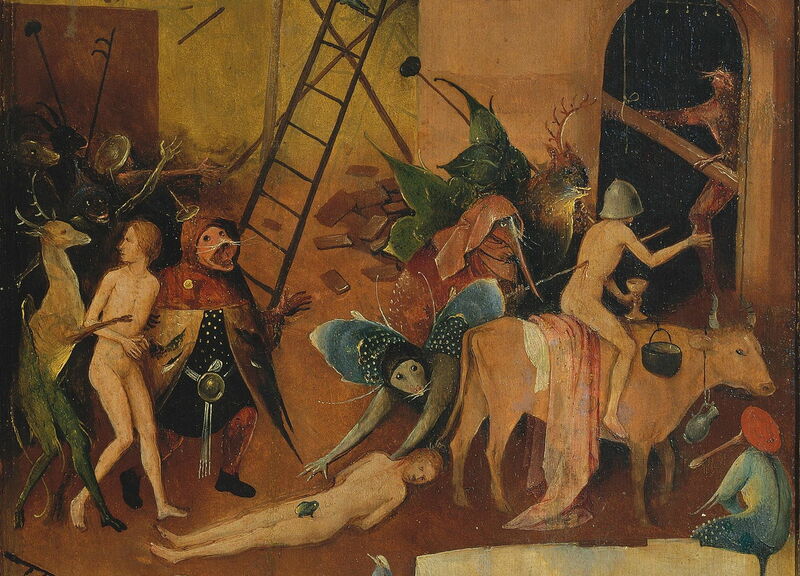 The right wing follows the general layout of Bosch’s previous depictions of Hell, with individual torments in the foreground, a tower in the middle ground, and burning buildings behind. Hieronymus Bosch (c 1450–1516), The Haywain Triptych (left wing, detail) (c 1510-16), oil on oak panel, left wing 136.1 x 47.7 cm, central panel 133 × 100 cm, right wing 136.1 × 47.6 cm, Museo Nacional del Prado, Madrid. Wikimedia Commons. 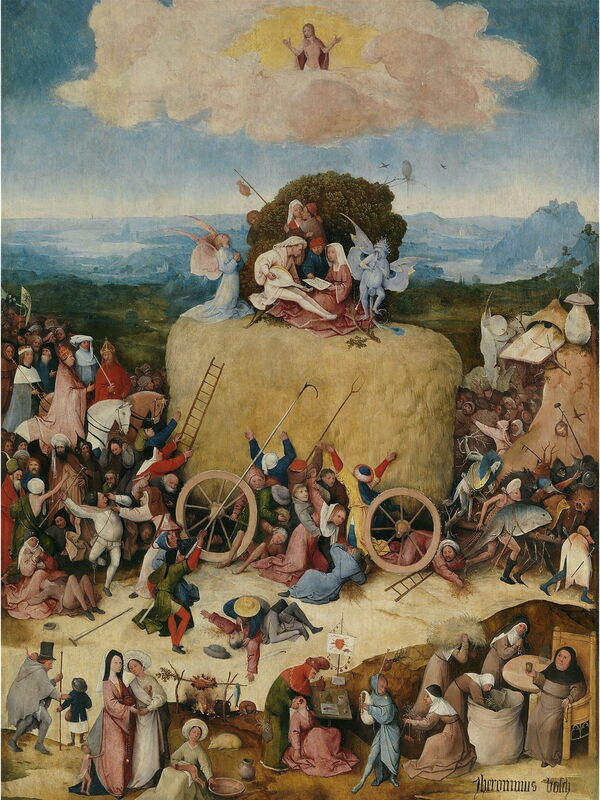 The scenes shown in the narrative of the left panel are similar to those used by Bosch elsewhere, although here they are read in an unusual order, from back to front. The anthropomorphic rock fountain follows the pattern seen in other paintings, but replaces the fountain towers he preferred previously. The creatures who appear on the right of the centre panel, apparently drawing the haywain itself, are typical of his portmanteau beasts, and a precursor to the daemons which appear in the right panel. Note too the blindfolded severed head being paraded on the end of a pole. The group making music and love on top of the hay have the benefit of an angel, and a devil, to draw them either way. Bosch’s signature owl is quite faint here, but clearly visible. Hieronymus Bosch (c 1450–1516), The Haywain Triptych (right wing, detail) (c 1510-16), oil on oak panel, left wing 136.1 x 47.7 cm, central panel 133 × 100 cm, right wing 136.1 × 47.6 cm, Museo Nacional del Prado, Madrid. Wikimedia Commons. By the time that the creatures have made it over to the right wing, they are more overtly malevolent, and torment the figures. 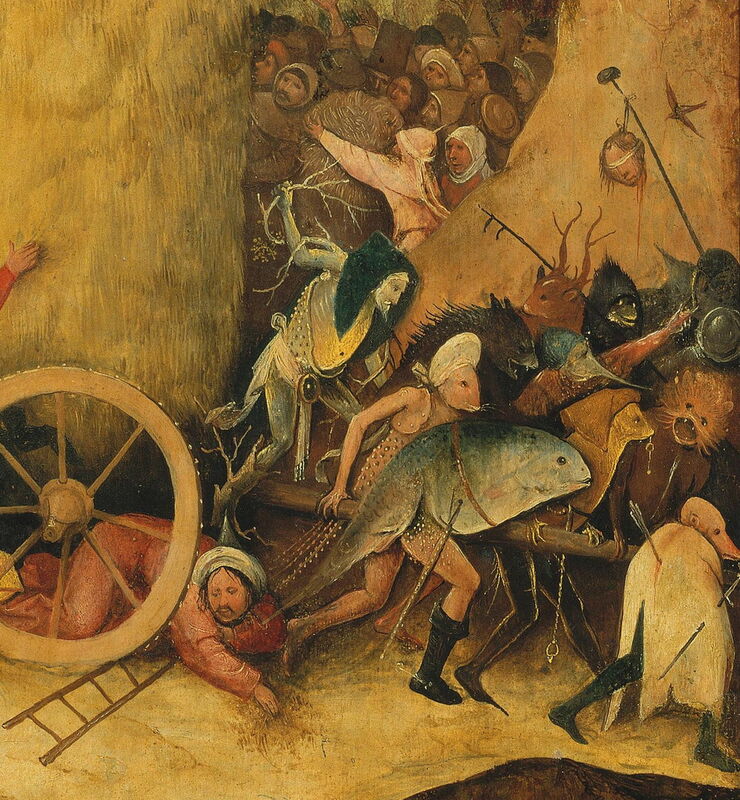 Several, including the impaled person on the ox, are seen in other paintings by Bosch. 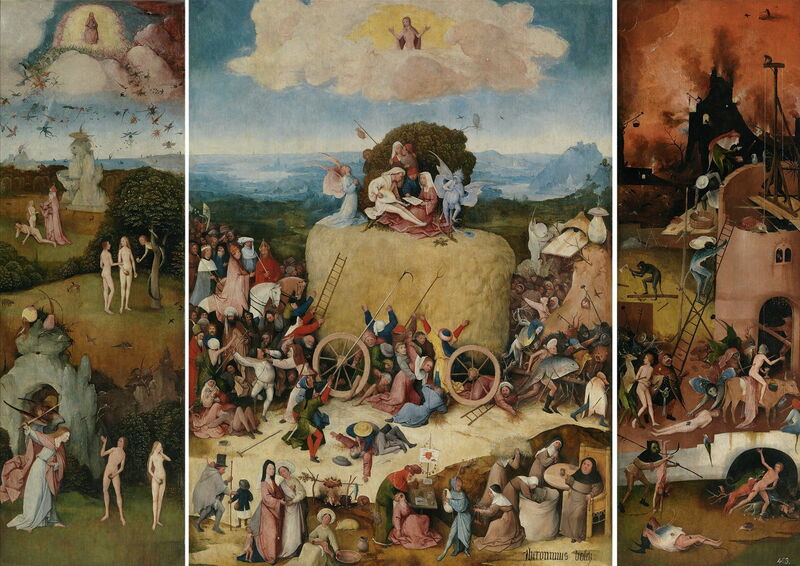 With the complete triptych, including its exterior, Bosch’s central allegory is clear. This is Everyman’s journey through life, coping with the dangers and perils around them. Starting from the fallen human, we move with the haywain, whether we are emperor, Pope, or a humble peasant. As we move through life, we are enticed into sinful ways, but by doing so risk going to eternal torment in Hell, rather than a place in Heaven. The chaotic rabble around the haywain show all the deadly sins: greed is dominant, together with lust, wrath, envy, gluttony, pride, and sloth. There is another, more general allegory too, which traces the history of mankind: from the Garden of Eden, through the Fall, to the ordinary run of the mill, before the Day of Judgement comes, and the end of the world. For what may be the latest painting by Bosch which still survives, that is surely only appropriate. There has been dispute as to whether this version was painted by Bosch himself, some of the arguments again centring on the handedness of the person who painted the underdrawing. Some have proposed that the version in the Escorial is the original, and this the copy, but Ilsink et al. find overwhelming evidence that this painting in the Prado was the first and original composition, and the Escorial painting is a copy. It commissioning and early history are unknown, but Ilsink et al. suggest that it may have originally been painted for Don Diego de Guevara (c 1450-1520), who was Philip the Fair’s chamberlain. There are many references to the two versions of the painting in Spain from the late 1500s onwards. At some stage, this triptych was broken up, and its panels dispersed, but it was later reassembled. Matthijs Ilsink, Jos Koldeweij et al. (2016) pp 336-355 in Hieronymus Bosch, Painter and Draughtsman: Catalogue Raisonné, Yale UP and Mercatorfonds. ISBN 978 0 300 22014 8. Posted in General, Painting and tagged Bosch, Brueghel, painting. Bookmark the permalink.